How adorable is this fit and flare dress by Sugar Lips? I was so pleased when I felt how soft and great the quality of the fabric was. This dress is so amazing on so many levels. For starters it's such a classic because of it's cream colour with the navy blue trim. It's also very pretty with the eye-catching, intricate embroidery and yet it's still slightly trendy with the subtle neon pink detailing. Outdoor events anyone? This is your dress! So something on my spring/summer wish list this year is a pleated skirt. I have this vision of a bright coloured pleated maxi however I reaaaaally fell in love with this on by DVF. Let's be honest you can't really go wrong with black and surprisingly the length didn't bother me even though it's a bit longer than what I would normal wear. I think it's clear if you know me that the leather band at the waist is what really drew me in to this skirt however quality was the other. I looked at a few pleated skirts on this day and I didn't realize how bad some could be. Some pleats were losing folds near the bottom and others you could tell that after sitting in the skirt for a couple hours you would probably lose all detailing. 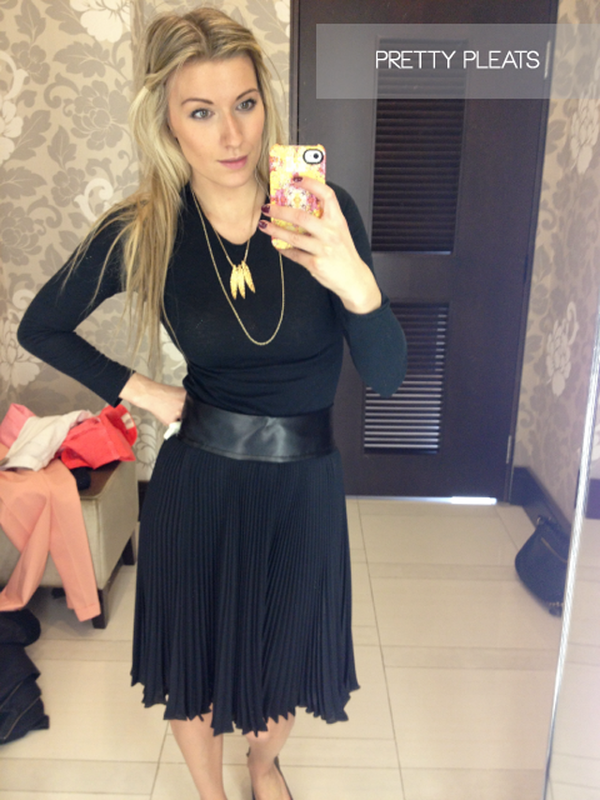 This skirt really was beautiful and worth the $400 price tag (that I couldn't afford). This whole mod trend that's resurfaced really has me hooked. Let's agree that stripes are always on trend for spring/summer but these black and white wide stripes are a whole lot of fun! This dress is all sorts of flattering too. By repositioning the stripes along the sides you get the illusion of a much slimmer frame and who doesn't love that??? If you're looking to spruce up your daytime work look then rock this dress and throw a blazer over top if you must! Oh ya! The stripe is back folks! This had me laughing to myself because all I could think about was a pair of wide leg jeans that I was obsessed with back in elementary school that had a thick black and white stripe down the side! Yep, just another blast from the past that I thought would never return and now that it has I already own two pairs of trousers with the stripe! I've mentioned before that some trends take me a while to warm up to and seeing as how this was one that had me cringe I'm shocked I was so quick to jump on board! PS. Check out what a creep my pup is. He was on guard the entire time I was playing dress up. Uhhhhh this blouse is so pretty! The exaggerated ruffle sleeves are so adorable that it would be such a show stopper at any outing. If my stomach was a bit more toned I would rock this baring my midriff however I also think it would look beautiful paired with a high waisted skirt or even worn over another top to give it a two-toned look. Whatever way you wear it you will be looking angelic! The final look is this little black and white cropped jacket. OMG black and white is all the rage right now! Are you not seeing it EVERYWHERE like me? I'm finding it difficult to resist... not that I want to. Since I'm a huge fan of colour blocking I really love how they engineered this jacket - I think it's perfect right down to the fit. I wouldn't style this jacket with the shirt under it like I have in this photo, instead the jacket would be the shirt since it's so form fitting. Because of it's sleekness I would complete the look with a black pair of tight leggings - HOT! wow i love ur HAIR in all these photos! xO!